I need to read again and again that “The Impossible” is a Spanish film. Despite the international cast (Naomi Watts and Ewan McGregor) and its shooting in Thailand, Juan Antonio Bayona got Spanish money “to demonstrate that we are able to make spectacular films”. Without a doubt, it is. It’s one of that kind of titles I wanted to collect on my page as essential. The film was shot during 25 weeks in Thailand and Spain and it needed a tank of 12 millions of litres of water, one of the biggest in the world, in “Ciudad de la Luz” (the city of light) in Alicante (Spain). 12 millions of litres! Bayona’s second full length film -the first one was El orfanato– is a success thanks to the children who are the leading actors: Tom Holland (Lucas), Oaklee Pendergast (Simon) and Samuel Joslin (Thomas). 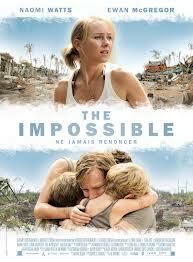 Thanks to Holland and Naomi Watts (playing María, the mother), “The Impossible” becomes a real event which convinces you from the beginning to the end, and suffocates you when the tsunami leaves them under the water; or when Watts is worried about the colour of her leg and asks her son again and again if her leg is black. These are some of several examples about the film. A real story of how one instant changes your life… Everything.